In 2016, Amtrak and Chicago-based architecture firm Goettsch Partners undertook a renovation project to restore the Burlington Room of Chicago’s Union Station. 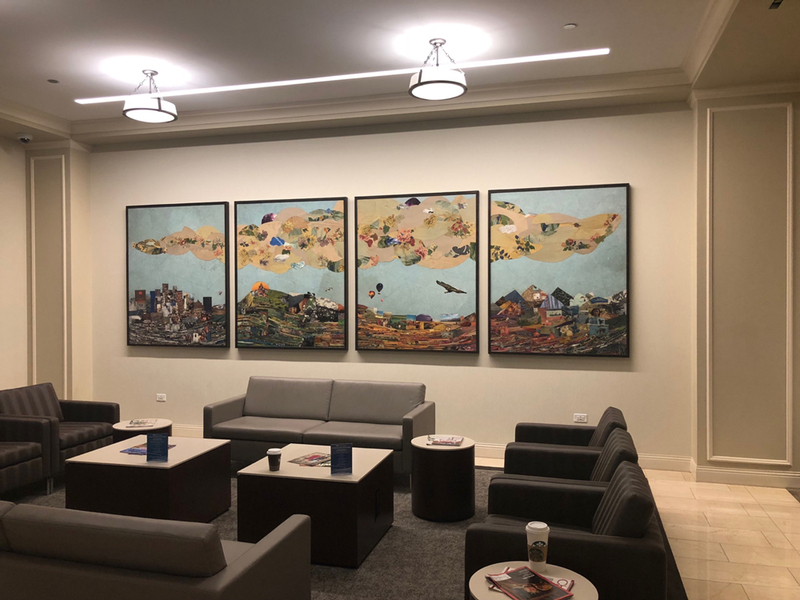 SAIC became involved with the project when Amtrak reached out to the Historic Preservation program to find an artist who might be interested in creating a new art piece from the remnants of the historic wallpaper that originally adorned the walls of the room. The damaged wallpaper pieces were then used to train young preservationists in the art of paper conservation, and Ashley Pastore (MFA 2018) was chosen to create a new piece from the remnants of the wallpaper. Three of the four Asian-inspired paper murals were restored but the fourth suffered too much water damage and had to be digitally reproduced. After the strips were removed and copied for reproduction they were given to Pastore who transformed them into a new art piece titled Riding the 4ft. 8 ½ in. that depicts the artists impression of cross-country travel by train. Pastore’s artist's statement credits a New York Times article by Gabriel Kahane titled “How the Amtrak Dining Car Could Heal The Nation” as her inspiration for the piece. “This piece is made up of imagery from many different sources of media to create a landscape that flows symbolically from the East to West coast of the United States and portrays the diversity and uniqueness of this great country,” reads the artist's statement. A new four-part series titled Art and Design in Chicago premiered on Friday, October 5, on WTTW with the first episode "If You Build It." The series covers a wide range of Chicago artists and designers.